Ever hopeful that the weather will improve just because I will it to be so... We consulted our weather sources in the morning, only to find our hopes dashed. But we have only so many days with Brittney and we are determined to show her all of the wonders of Cruising Life. We left Hope Town on the morning high tide and set our course a few short miles to the northwest for some snorkeling. The reef here is part of the preserve and is some of the best snorkeling to be found in the Abacos. I found snorkeling resources here and here and pretty much had our picks for the week planned out before Brittney arrived... it was all up to the weather to provide favorable conditions. The reef just off of Fowl Cay has mooring balls provided so that shallow draft boats and dinghies can be secured without damage to the reef. The balls are difficult to see until you're right on them. We picked the first one we saw and jumped right in. We saw no sharks but we did see plenty of other reef dwellers and as usual, the pictures do not do justice to the beauty of this place. Although the skies were cloudy, we did have a few brief sunny moments, but with the calm conditions, the visibility was still pretty good even without the sun's assistance. We snorkeled around the shallow reef until we began to get tired and chilled. It's amazing how strenuous snorkeling can be with the current and we were physically ready to get out, while mentally we could have stayed all day! The calm conditions topside hid the power of the water as it moved to and fro across the reef. We were lucky that we arrived near high tide when the waters were still coming in but not moving over the reef as strongly as they would during max ebb or flood. Paying attention to the tidal currents is important when picking a time to enjoy these underwater delights and can make the difference between a pleasant or a harrowing experience. But we all three left the water just thrilled with what we had seen as Brittney declared this the best snorkeling she's ever done! We enjoyed an afternoon of foolishness and laughs here in this little puddle protected from the surge just beyond the rocks. If you don't want to see pics of my beautiful kid, do not look here... I'm really trying hard not exploit her for HER sake...but she IS the Star of this show! Well in the interest of packing a lot into a short time... it was time to move on. Next stop, Man-O-War Cay. You might remember our first visit to MOW. We spent a night in the mooring field in the town proper where the locals extended a less-than-warm welcome. Bruce and I had taken a long walk to this spot where the cay narrows so that you can see both the Atlantic and the Sea of Abaco with a turn of the head... we wanted to return to this spot with the boat and show this magical place to Brittney. My sources told me that there was a deep (deep enough for our draft) basin just off the small beach. There were several boats anchored outside the shoal but I wanted to bring the boat in closer so that we could enjoy the beach more easily. Luckily the tide was (sort of) with us so we decided to go for it. We held our breath as the depths dropped going across the shoal, but then they began to climb again... we had made it easily over the shallow strip that guarded this gem. 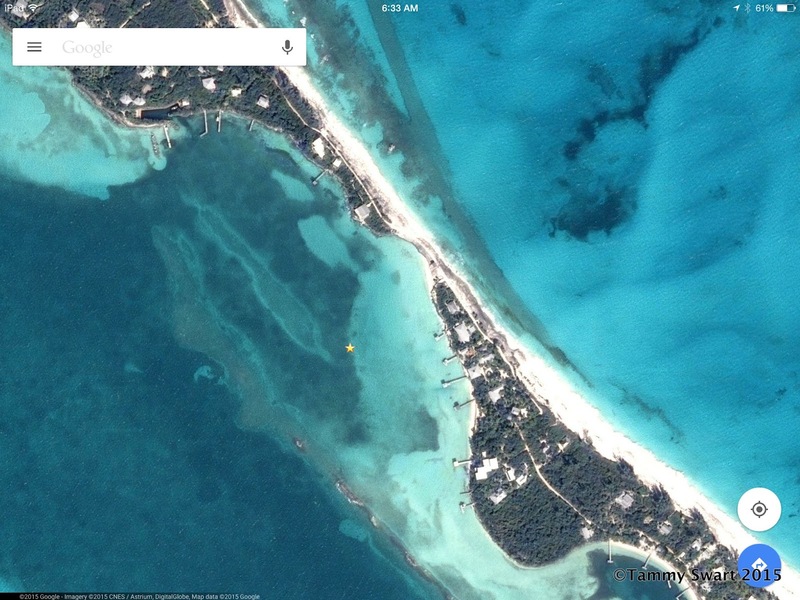 You can see in the Google screen shot that Man-O-War Cay narrows to just a mere strip at this spot. On our side is the Sea of Abaco, on the other side is the Atlantic Ocean. This place can be a wild and treacherous adventure.... or it can be calm and placid like today. We took the dinghy ashore to get Brittney some Atlantic Beach Time. The beach here is strewn with sections of jagged sandstone alternating with stretches of soft white sand. The scrubby bushes writhe eternally in stark testament to the wildness of this place. Our short shore excursion stretched on into the late afternoon. We visited with some of the Locals who were enjoying their holiday in the gazebo. We met the resident nurse who serves as the primary medical caregiver for all of the residents of MOW and got a glimpse into her life here with her son. The government pays her salary and for her housing so that she will be on call 24/7 to these people. She has the duty of providing whatever they need, whenever they need it, with the help of physicians in Marsh Harbor should she find herself with more than she can handle. In exchange, she gets to live in paradise and raise her son in a different world than most. What a life! Back on the boat we had dinner and settled in to enjoy our evening and an early night. The next morning dawned a dark and dull gray. Bruce and I were up early having coffee in the cockpit and watching a short scene unfold. There were only three sailboats anchored in the basin on this side of the shoal. The boat you see here was facing the other direction when we got up. I looked around at the other boats all pointing the same direction... except for this boat. Yes, they were solidly aground. The people on the boat woke up and came out to survey their situation, then grabbed a cup of coffee and toasted us as they sat down to wait for the tide to lift them... which it did very soon. What else could they do? We cheered as their boat slowly began to pivot and fall in line with the rest of the fleet. What a great attitude! Our Jezabelle started out her life as Brittney's cat. We were in no hurry to leave since we would be moving only another few miles to Great Guana Cay just to our north. Well, that and the fact that that same low tide that held our friends was holding us captive in the anchorage basin... The ominous clouds provided a cool morning for us to lounge around. Brittney has been dedicated to her exercise routine, working out almost every day on the boat. The proof is in the smell of her workout clothes and it must be dealt with. Soon! We handed her our wash bucket and plunger, poured in some of my home made laundry soap and put her to work Cruiser Style on the foredeck. She worked her clothes over by alternate means this morning, thank goodness... and hung them out to dry on the lifelines. Very soon nature provided a replacement of the water used to wash clothes... Those ominous grey skies opened up and dumped a wall of water upon us. Not wanting to squander a Cruiser Moment, we sent Brittney out with the wash bucket to collect rainwater as it poured from the deck drains. She collected much more than she had used and had a blast (and a few chill bumps) doing it! As quickly as the rains came, they were gone again leaving us in glassy stillness once again. The tide was high enough for us to escape the shoal. It was time to go.